My little 15-month-old stinker (aka Daisy) broke into the pantry and found her favorite snacks. 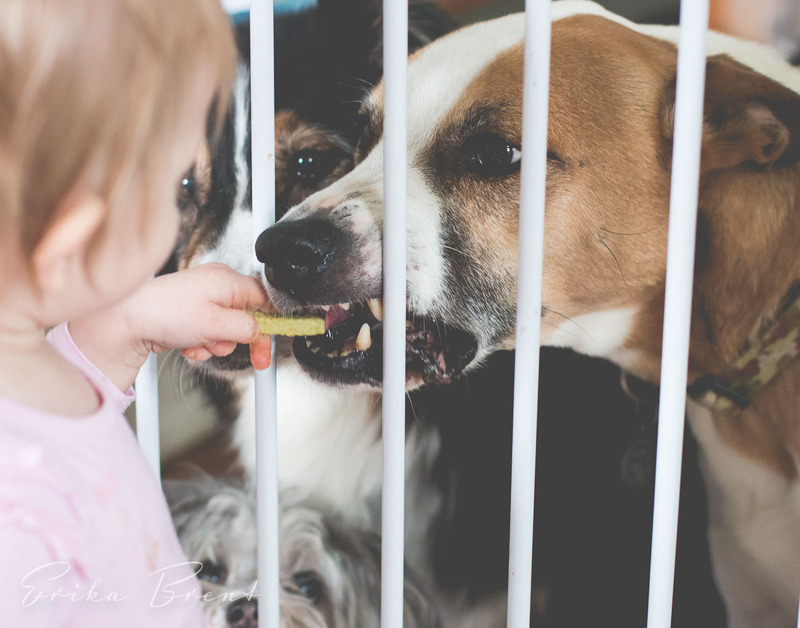 Being the kind little devil that she is, she decided to share her snack with dogs on the other side of the dog gate (we use the gate to separate the kitchen from the rest of the house). The dog Daisy is feeding is Jasper. He came to us as a foster, and ended up becoming part of our family. When he arrived he had massive food aggression. We hand feed him for about a year. Basically we would wait for him to calm down and give eye contact then slowly open our fist to allow him to eat the food. We repeated this until for each meal. While this picture captures the moment when you see his teeth, he is not harming her and is careful to not use his teeth on her. He is the most loving and kind dog. He no longer shows any signs of aggression for food. He gets pretty excited about food, but no aggression. Jasper is still VERY sensitive and you can’t debate politics when he is around or he will go shake in the corner. I am very careful to teach my children that while dogs are part of our family, dogs (and all animals) deserve respect and we must be careful with our movements and hands, even with our own dogs.